It's Season One finale time: James and Donna find the missing tape, Jacques Renault takes the bait, Deputy Andy finds his chance to shine, Audrey makes her debut as the Queen of Diamonds, Josie unexpectedly finds herself in some bad business, the plot against the Packard Sawmill comes to fiery fruition, and Cooper decides to get some room service. In classic cliffhanger fashion, the fates of no less than a dozen characters are left up in the air. Who lives? Who dies? Tune in next week, same FaFa-time, same FaFa-channel! 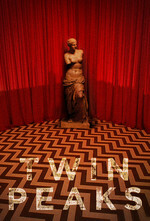 Bonus Stuff: Just in time for the end of Season One, here's The Secret Diary of Laura Palmer (pdf). A spin-off novel written by Jennifer Lynch (daughter of David), The Secret Diary was published on Sept. 15, 1990, two weeks before the original airdate of Twin Peaks' Season Two premiere. Told in the voice of Laura Palmer, the novel recounts key events of her life starting from age 12 to the weeks preceding her murder. Although the true identity of Laura's killer is not directly revealed, attentive readers will be able to figure it out from the clues provided. More info at Wikipedia. I've really been enjoying the rewatch and these threads. I watched part of the series when it was originally aired, but missed a lot because of travel, inattention, etc. I was lucky enough to find a set of the 2007 DVDs at a library sale a few weeks ago. I find I've forgotten a lot of it outside of the Laura Palmer mystery. The highlight for me in this episode is watching Cooper put it over on Jaques. But the cliffhangery-ness, and the number of reveals and events made it all seem a little over the top to me. It all worked though. I had to go straight on into watching the next episode. I think the over-the-topness is all part of the fun. Whereas Dallas was able to hang a headline-grabbing cliffhanger on "Who Shot J.R.? ", Twin Peaks goes for the more-is-more approach. Granted, the show can't kill off half of its main or supporting cast (oh hai there, Hannibal Season Two finale...), but it's an impressive bit of plot engineering to get all of these balls in the air at the same time. There's a great moment in the first episode of the next season where they explicitly reference tgat way too much happened in this episode. The giant seems to be another of those forgotten Twin Peaks characters -- I haven't seen any Twin Peaks giant tattoos or fan art. Weirdly, he's my girlfriend's favorite character. I like the giant as a character. I've been watching the show (for the first time) this month and I'll be done with season two soon.. should I watch the movie after that? Maybe part of the reason why the Giant didn't make that much of an impact was because actor Carel Struycken was in all sorts of things around that time: He also played Lurch in the Addams Family movies and was already pretty familiar to genre fans as Lwaxana Troi's personal valet Mr. Homn on Star Trek:TNG. For a while there in the late '80s/early '90s, he was like a softer, more approachable version of Richard Kiel. Either Cooper was role-playing the part of Mr. Moneybags to the hilt for Jacques' benefit, or he has some truly terrible blackjack instincts: Coop was sitting on a 19 and told Jacques to hit him anyway. Zen card-counting? We knew that Leo was kinda dumb, but his plan to dispose of Shelly while torching the mill is off-the-charts stupid. Leaving the charred remains of your girlfriend in the middle of the building you just burned down gives investigators two pieces of evidence for the price of one. The shot of Hank standing in front of Pete's antler trophy was great for a couple of reasons: Not only do the antlers mark him as a cuckold (if only Big Ed would get around to it...), but now I think I know where Bryan Fuller got the idea for the horned killer apparition in Hannibal. Leo watching his Invitation To Love doppelganger "Montana" die on television, as Leo himself bleeds out on the couch is just some masterful staging.